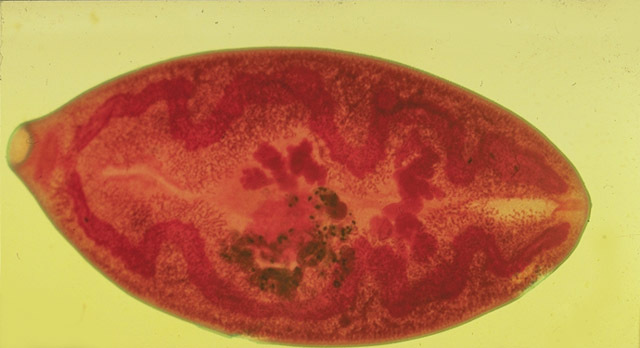 Paragonimiasis is caused by lung flukes of the genus Paragonimus. There are several zoonotic species described which infect humans. They all have a complicated life cycle with two intermediate hosts. In addition to humans, dogs and cats can also serve as final hosts. Adult worms live encapsulated in the lungs or in other ectopic locations. Eggs are found in the sputum or when swallowed in the faeces. Within the egg, a miracidium develops and hatches in freshwater. As for all trematodes, the first intermediate host is a snail in which thousands of cercariae develop. These have to find a second intermediate host – crabs and crayfish – in which cercariae encyst in the gills or in the body muscles and develop into metacercariae. Infection in humans results from ingestion of raw infected crabs or crayfish. Metacercariae excyst in the duodenum. Young flukes leave the intestine, migrate within the abdominal cavity, penetrate the diaphragm and invade the pleural cavity.